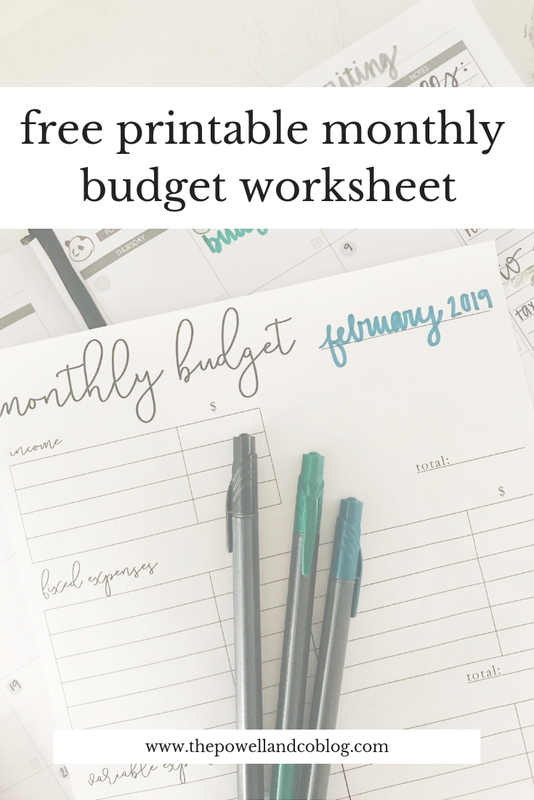 free printable monthly budget worksheet — Powell & Co.
WHOA! It’s almost the beginning of February! I hope January treated ya’ll well. I am usually not the biggest fan of January, but this one was pretty good. Perhaps it's because I kept the winter blues at bay? Anyway, 2019, you’re alright with me so far! When you take your total income and subtract your total expenses, any left over can be applied to savings (or to extra debt payments). I have created a free printable monthly budget worksheet to help you get it all down on paper. This method has been incredibly helpful on my debt free journey and I know it can help you, too! Simply sign up below to get your printable straight to your inbox or click here to download instantly. You can also download the matching monthly calendars here! By signing up today, you get your free printable worksheet and all future printables directly to your inbox. I only send out 1-2 emails a month and promise to never ever share your email address with anyone. I respect your privacy. I only send out 1-2 emails a month and promise to never share your email address with anyone. I hope you enjoy your free printable and get lots of use out of it! I use them at the beginning of every month and it is one of my favorite past times now. Don’t tell 2013 Sarah that, she’ll think I’m a weirdo. Let me know what budget tips you have + how you use your new printable in the comments here or on Instagram.